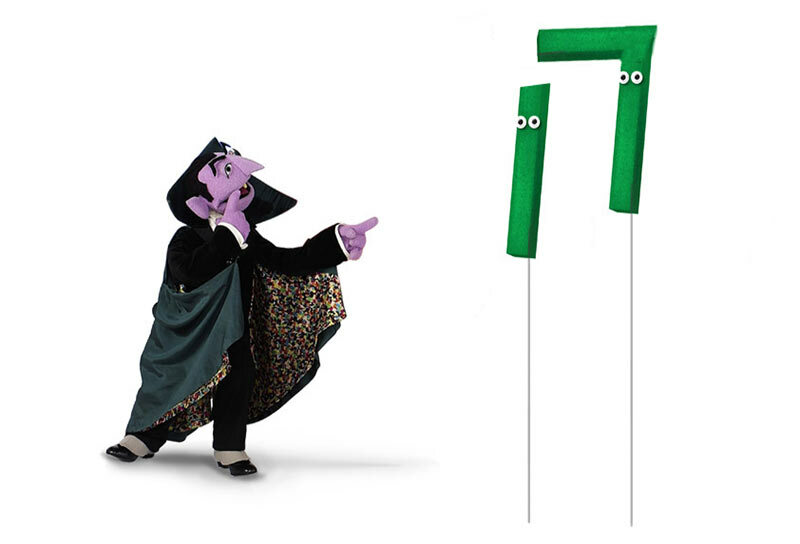 This page is brought to you by the Number 17. And 16. And 18 and 19. And with the kind help of our friends at The Folger Library. Seventeen is magic to Oxfordians. They see it everywhere in Shakespeare’s work, enwoven in the very fabric of his poetry. Septimodecimists find 17s in the praises of Ben Jonson, in Francis Meres’s catalog of poets, underlying and denying what they plainly wrote. That language, to initiates, is but a screen, devised to hide a deeper truth, encoded in, occulted by these writers' “arithmetical arrangements.” "Read the puzzle, not the poem," they urge us.1 Words lie; but numbers? Never, if properly manipulated. By divination with 17s, the tribe of Ned can find him stamped on every page. This belief is more than talismanic—it is Trinitarian, the central mystery of their faith. Their Lord has hidden patterns of himself—his “authorial watermark”—in his creation. They could have used any number. There was no Edward de Vere, 17th Earl of Oxford, until the antiquary Thomas Milles invented him in 1610. There had been, of course, an Edward, Earl of Oxford, who succeeded John, the sixth of that name. There was still an Earl of Oxford, for that matter: a Henry. There had been one since the Domesday Book—it was among the oldest of creations—and the living earl was always just the Earl of Oxford, as the king’s the King. Who else could it be? Comes mortuus est, vivat comes. You will note that this lineage begins with Edgare Ethelinge, and that Edward’s is the 19th name on the roll, the 18th called Earl, and the 16th called the Earl of Oxford. So much for the sacrosanctity of 17! Edward Oxenford signed himself “Edward Oxenford.” He never used an ordinal; nor did his peers; nor do any of their 21st-century descendants and supplanters. None is needed. Ordinals are used of a peer, not by him. While he lives, he is the Earl. There is no evidence that anyone in Oxford’s lifetime ever called him the 17th Earl. I’ve searched surviving documents. That ordinal is absent even from the most formal of court papers, even from his uncle’s petition concerning the young earl's legitimacy. The Cecils didn’t use it. I’ve searched Early English Books Online for ordinals proximate to “earl of Ox[en]ford,” in all its variant spellings. Nothing. Not in dedications, not in libels, not at tourneys nor in parliamentary pomp, not in the order of King James's coronation ceremony. Seventeen—that fetishized number—just wasn’t a thing. Because Elizabethans didn’t number peers that way. We do. After a time, a collection of anything—earls, books, Star Wars figurines—gets unwieldy. Numbers are a great convenience. Since the 14th century, kings and queens have been numbered by their Christian names: “Roy Henry quart puis le conquest pier a Roy qore est” (King Henry, fourth since the conquest, father to the king that now is). 4 It took far longer to agree upon a system for the aristocracy. Now we assign ordinal numbers (1st, 2nd, 3rd...) to each duke, marquess, earl, or viscount in the order of succession. With each new creation of a title, the counter is reset, and starts over at 1st. Historians and heralds then were still experimenting with new ways of ordering their data. In the 16th century, and through much of the 17th, the use of numbers is occasional, and there is no one system. Often chroniclers will number earls by Christian name, like royalty. “Simon the second, Earle of Northampton, then liuing.” (He was the 4th Earl.) Compare in Holinshed: “Malcolme the third of that name king of Scots” or “Charles the eight of that name, king of France” with “Gilbert de Clare the second of that name that was earle of Glocester and Hertford.” By our count de Clare was the 7th Earl of Gloucester and the 6th Earl of Hertford, but he was the second Gilbert de Clare to be earl of both: there was a Richard in between. 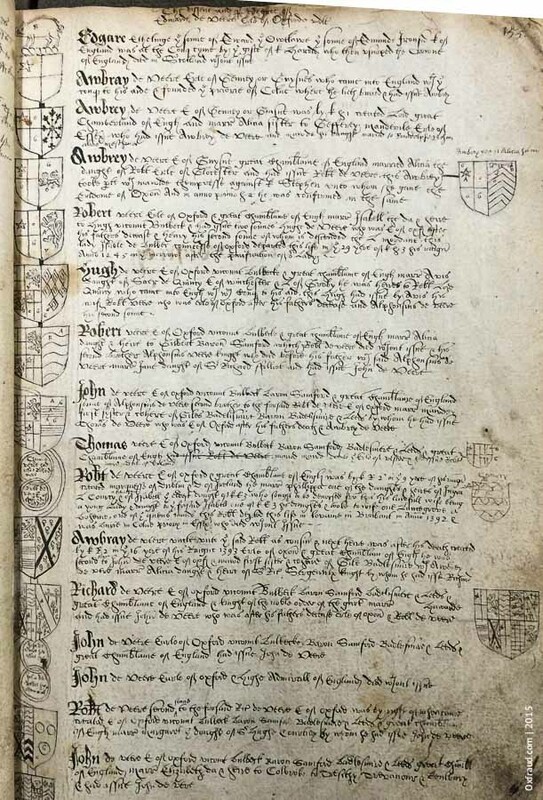 Now and then, but inconsistently, chroniclers will number by family name: “Humfrie de Bohune, the eight [seventh, in fact] & last erle of Hereford of that surname of Bohune.” This is almost but not quite modern practice: nobility in one creation can have different surnames, or bearers of a single surname can belong to more than one creation. So for example, in the first creation of the Earls of Arundel, the 1st–5th are surnamed d’Aubigny, and the 6th–8th are FitzAlan. Ordinals, in any case, are scarce. I’ve searched EEBO for texts from 1473-1675 naming the three oldest earldoms still extant in the 16th century: Arundel, Oxford, and Northumberland. Before Thomas Milles—that is, through 1609—there were 670 hits in 94 records for all variant spellings of “Earl of Arundel.” There was one ordinal. For “Earl of Ox[en]ford” (471 hits in 109 records) there was one, in 1605, and that merely a “first.” For “Earl of Northumberland” (819 in 93 records), there were only three, despite the bewildering proliferation of Percys (“and every one was an ‘Enery”). Numbers are for hoi polloi. The metric that matters to the aristocracy is precedence. The number of earls who have borne a title does not determine rank, any more than hat size measures height. The English nobility is ranked “according to the anciencie of their creations, or first calling to their degrees.”6 That is their fixed place in the heavens of the court. Until the ending of their lines, the Earls of Arundel outrank those of Oxford, who outrank Northumberland. It’s Aries, Taurus, Gemini. The number of stars in the constellation is irrelevant. By these time-honored conventions, Edward’s father would have been “the Earl of Oxenford that nowe is“; then “the late Earl” or just possibly “John de Vere, the sixth of that name.” Not the 16th Earl, any more than the Queen was the nth monarch of England. She was Elizabeth, the first of that name. Quick, what King of England is Richard III? No, what number King? How many? Harrys four, five, six ... then who? Eighteen. Or is it 19? I lost count. I wonder what mnemonics the Elizabethans might have used. If you were a courtier who dared to ask, “My Lord, what Earl of Oxford are you?” you’d have gotten a cold blank stare. “Edward that now is, the first of that name,” the secretary at his elbow would have said. At first glance, this pedigree looks authoritative—if you don't already know what the lineage ought to be. We know, because of long hard work by antiquaries. They, the Elizabethans, were only just beginning to sift and weigh evidence in genealogy; to work from original documents and artefacts, rather than fables. They were learning to map. Sir Robert de Vere was never Earl. He was the second son of Richard 11th, and his brother, nephew, and great-nephew, all Johns, were the 12th through 14th Earls. He was the grandfather of John 15th, not the father of John 14th. And his wife was Jeane. An anomalous record? This looks like the result of centuries of accreted errors, copied and recopied. Eye-skip? But it's all worked out. You could draw a family tree from this, and never know that it was wrong. A fraud? The errors swerve from the true descent, but don’t branch: the legitimate heir is still legitimate. And so down to Edward, with blanks left for his wives’ first names, and “Trenthams daught” in fainter ink, overwritten. Seventeen minus two plus one = sixteen Earls of Oxford. Imagine you’re the Viscount Bulbeck, trying to learn your ancestry from such a heap of contradictory and confusing documents, all gorgeously blazoned. Could you guess what history was true, amid the forgeries and faults and romance? Would you believe a pedigree deduced from Adam or from Arthur? Yes, if it ended in Edward. Mind you, this was knowledge for the inner circle, the elite. These are the histories that the ruling classes told of themselves. The cover title of this manuscript notes that the blazons within were “tricked [sketched in ink] and extracted, from visitations & pedigrees in the Heralds Office”: that is, from genealogies collected from the families themselves, under warrant, by an officer at arms. Government records are only as good as their sources. If even the College of Arms couldn’t get Oxford’s number straight, how on earth would a mere Elizabethan commoner—a Meres—have figured out what it was, even if he'd wanted to? He would not, I think, have had access to the de Vere family papers, safe in whatever library still had a roof. There was nothing like a systematic peerage—a Debrett’s—to consult. Neither Stow nor Holinshed nor Camden numbers any of the Earls of Oxford, save the first, that mysterious “Edgare Ethelinge” or “Algar the sonne of Leofrike.” (He appears to be Ælfgar, Earl of Mercia, son of Leofric and Godgifu—that’s Lady Godiva to you. )8 Even the closest reader would have had to puzzle out the Earl’s lineage like a jigsaw scattered into many boxes, missing half its pieces—why bother? Truly it boggles the imagination that anyone in Edward’s lifetime—including himself—would have pegged him as the 17th Earl of Oxford. Who knew? Another Jacobean sea change Oxford didn’t live to see. Milles’s book was clearly a labor of love. Though a gentleman amateur—he worked as a customs officer, like Chaucer and Melville—he was the nephew of the late extraordinary Somerset Herald, Robert Glover, and worked from his uncle’s unpublished manuscripts, consulting with many of the greatest antiquaries of his time: Lord William Howard, Sir Robert Cotton, William Camden. Indeed, Camden’s own Britannia (1594) had been founded on Glover’s work. 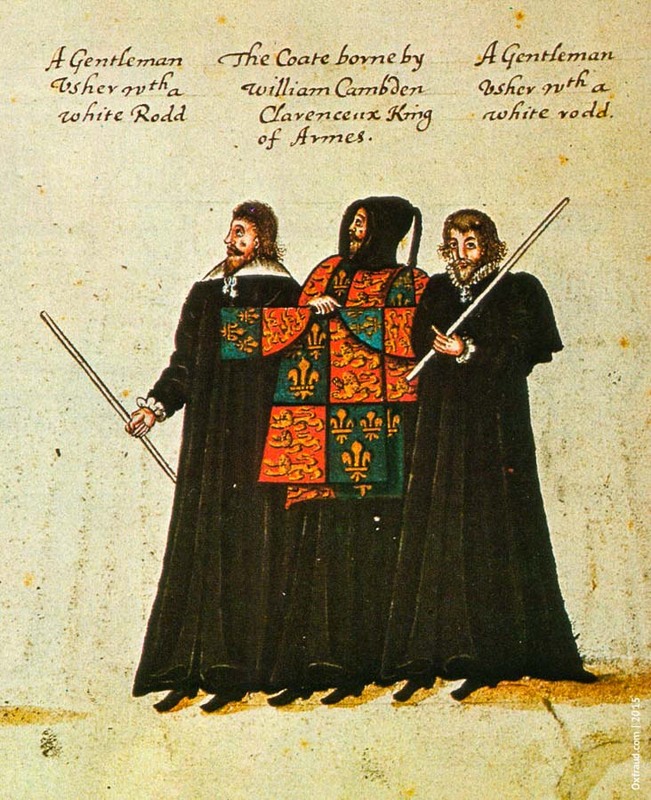 “Glover was the heralds’ heraldist,” writes Nigel Ramsay in the ODNB. 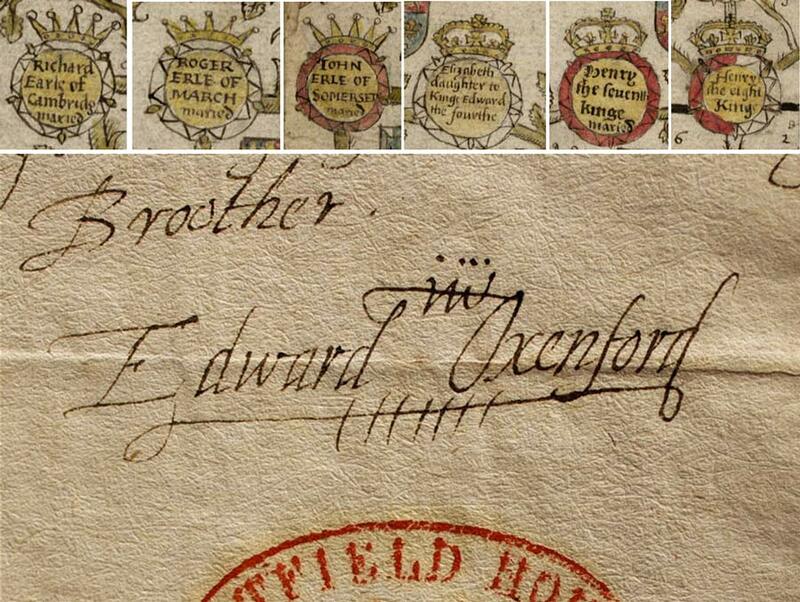 “In the ten years to 1588 he succeeded in locating and copying most of the medieval English rolls of arms ... Glover's ordinary was assembled in its first form in 1584; with its 15,000 coats it was soon recognized as being of unprecedented accuracy and fullness. It came to form the basis of all subsequent ordinaries, and only in 1992 did it start to be superseded.” And that took a computer. Four hundred years as a gold standard of scholarship! Now that’s a geek. I’m awed. 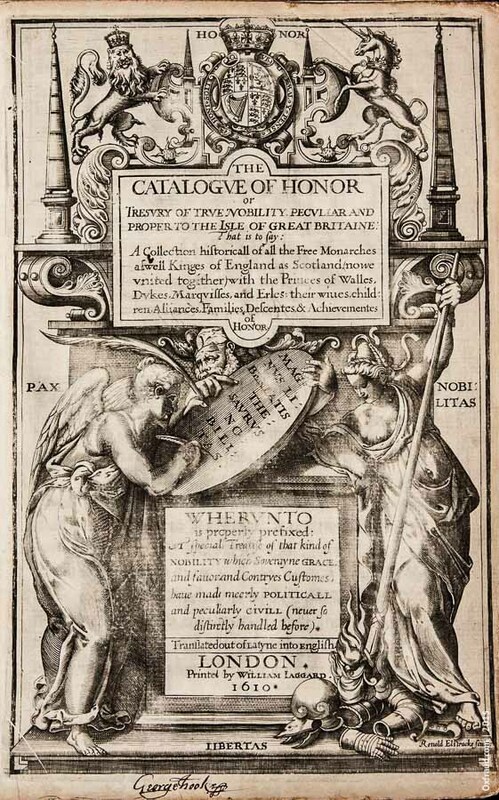 The catalogue of honor is a beautiful, expensive folio. Few could have afforded it. By itself, it might have had little public effect. But Milles’s was not the last word. His thumping huge book on the nobility of England and their lines of descent was answered by another, by a far less mannerly antiquarian. Enter Ralph Brooke, that contentious herald. What the new heraldry needed was more than a monument. It needed a controversy. Brooke, of course, is that captious York Herald who charged Sir William Dethick, the shady Garter King of Arms, with the elevation of riff-raff 11 like “Shakespear the player” to the gentry. Later, he would play a cruel prank on another rival, Sir William Segar, tricking him into granting arms to a common hangman. Both trickster and gull were imprisoned, briefly. His 1619 masterwork, A catalogue and succession of the kings, princes, dukes, marquesses, earles, and viscounts of this realme of England, intended as a scourge and a correction to all previous heraldry, provoked the bitterest passage in the war. Brooke’s corrective Catalogue itself turned out to be riddled with errors, as his critics (not without malice) pointed out. Brooke, in turn, accused his printer, Jaggard, of creating the faults. Then he flounced. 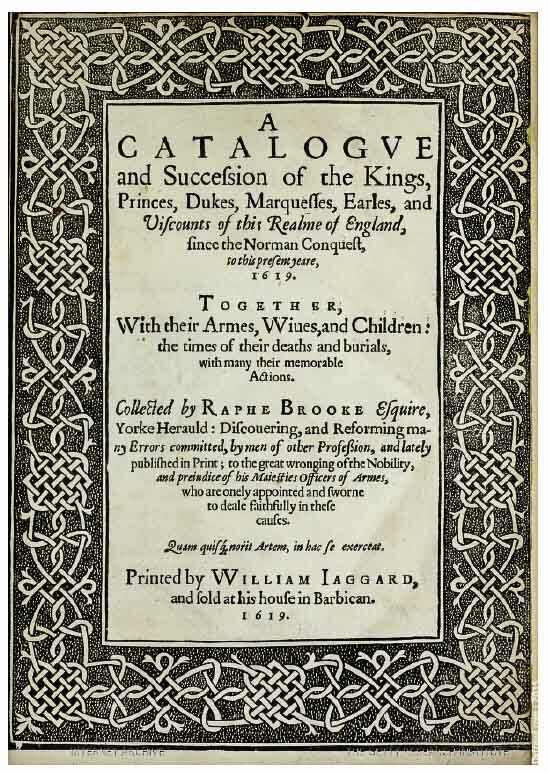 He gave his book to one of Jaggard’s competitors, and a second edition appeared in 1622, with a stinging dismissal of Jaggard on its title-page. In his turn, Jaggard, meanwhile, halted work on the First Folio to rush Augustine Vincent’s rejoinder into print. His fastidious Discoverie of errours in the first edition of the catalogue of nobility (1622) includes the original text, “printed heerewith word for word,” a critical metatext, a commendatory letter from Jonson’s close friend Selden, and a so-there! preface by Jaggard, who rewarded Vincent with one of the first First Folios to come off the press. 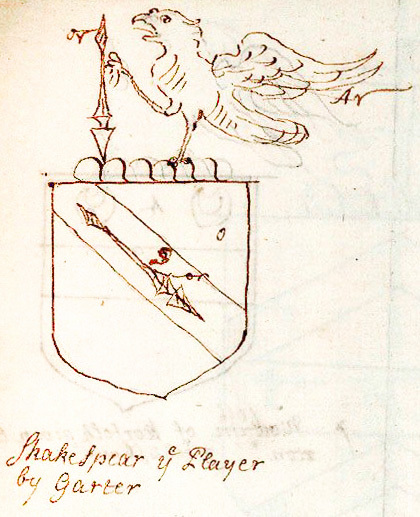 Since the tribe of Ned believes that Ben Jonson’s great poetic praise of Shakespeare in that Folio is full of occult 17s, it might be useful to interrogate his heraldry. Not Brooke’s, I would assume. That herald had aligned himself against a constellation of Jonson’s friends and associates: Shakespeare, Camden, Selden (the great legal and linguistic scholar, Camden’s champion), Jaggard. Vincent, by then Rouge Croix pursuivant, was a protegé of Camden’s. William Earl of Glocester vnder Henry II. Though I be short, I cannot be obscure. Since, naked, best Truth, and the Graces are. So much for Great Oxford. I doubt that Jonson would be writing eulogies in multiples of 17; nor swooning for an earl ungraced by virtues of the mind or spirit. Afterlife of ordinals: did they catch on? Eventually, of course, they would be de rigueur in genealogies, so much so that Oxfordians cannot imagine an aristocracy without them. But at first, they were a bit of a fizzle. John de Vere, the sonne of John de Vere, who was the sonne of Robert de Vere, who was brother to John de Vere, the twelfth Earle of Oxford, of that name, who was Father to the before named George, enjoyed all those dignities. He’s the fifteenth de Vere Earl. I had to count twice, using “twelfth” as an anchor. John de Vere, being the heire male of that Familie, was the sixth Earle of that Christian name ... Edward de Vere, his sonne, enioyed all those Honors. One token “twelfth” amid all the old stylings. Gervase Markham, on the other hand, took up the new convention (1624): “there haue beene of the name of Vere eighteene Earles of Oxford”; “Edward the 17 Erle of Oxford.” Others did as well: "Iohn Vere the xii. 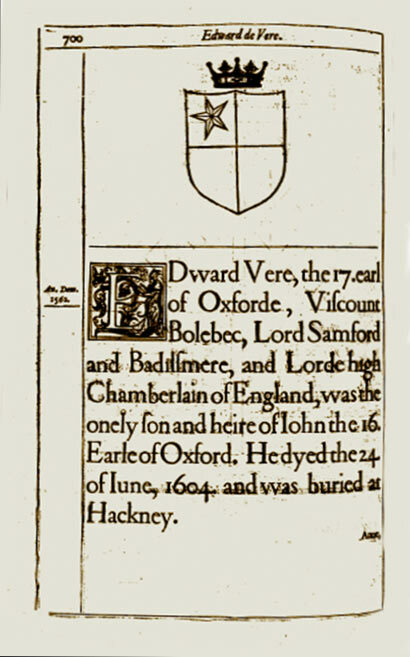 Earle of Oxford" (1631); “nephew to ... the fifteenth Earle” (1634); “Robert Vear ... the fourth of that name, and ninth Earle of Oxford” (1636). But rival and retrograde conventions went on appearing through the 17th century. 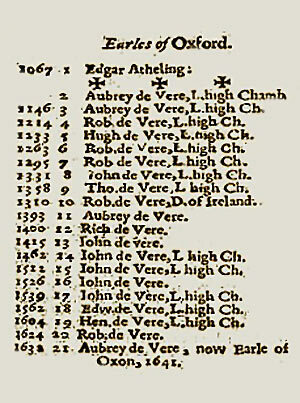 Peter Heylyn, in A help to English history (1652), lays out his own new method, “a bare and naked Catalogue of names and honours,” set forth in a series of tables. He lists every holder of a title ever, and then numbers them straight through. Having counted in a Matilda (Edgar Atheling), he makes Edward 18. A Restoration gossip, T.S., Gent., going perhaps on hearsay, thought Edward's son Henry was the 17th Earl (Fragmenta aulica; or, Court and state jests in noble drollery, 1662). John the Fourth, Earl of Oxford, who had Issue, John the Fifth ... and three Daughters. It was John the Fourth, Earl of Oxford of that Christian name, who dyed in 18. H. 8. without Issue. Ordinals count. That mistake in genealogy, the jurist argues, lost Robert de Vere the great chamberlainship to Lord Willoughby. It forfeited his lesser titles to the crown. These honors should have gone from John the fifth—the writer traces the descent—to “Awbrey de Vere now Earl of Oxford.” By now it's 1661. A hundred years after Edward, Viscount Bulbeck awoke to find himself an Earl, we’re still at now. How would de Vere have counted himself? All but certainly as Edward Oxenford, the earl that now is: the living avatar, in all his power and potential. In the new convention, which he’d never know, he would have been the 17th, the latest of a series. But the old style put him at the center of his august family, with all the others relative to him: the late, the last, the sometime earls. And posterity? It is sobering to see how poorly Edward was remembered in the histories, before a Gateshead dreamer reinvented him. Others of his line have stories: Richard’s minion, briefly a duke; the soldier; the traitor. Even his cousin Sir Francis Vere got a eulogy by Cyril Tourneur. Edward? Aubrey’s fart. The earl who was extravagantly praised while he had money—flattered to the point of parody—was all but nobody in death. No eulogies, no Works, no monument, no namesake. There would be, before the earldom was extinct, four Aubreys, five Roberts, six Johns. But Edward the First would be Edward the Last, merely the 17th of 20. 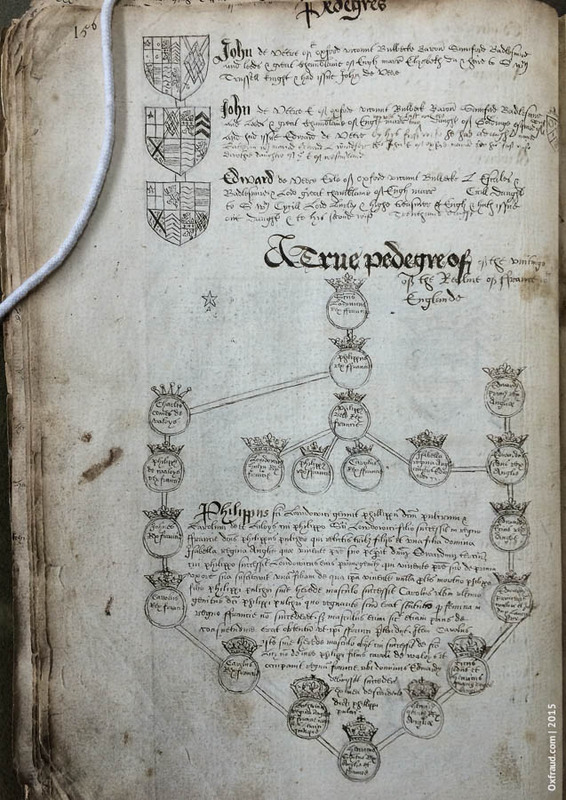 One of the most useful examples of Oxfordian work, principally drawn from The Complete Peerage by GE Cokayne, is an up-to-date family tree for the De Veres.